My Cuban ham salad has the flavors of a Cuban sandwich, ham, mayo, spicy brown deli mustard, dill pickles, and swiss cheese. It’s a simple combo, but it goes together so great. It constantly surprises me the foods my kids fall in love with, like ham salad sandwiches. This Cuban ham salad was one of those, oh geez I need dinner on the table in 10 minutes what can I throw together real quick kind of things. They absolutely loved it and now ask for it regularly! My Cuban ham salad has the flavors of a Cuban sandwich, ham, mayo, spicy brown deli mustard, dill pickles, and swiss cheese. It’s a simple combo, but it goes together so great. 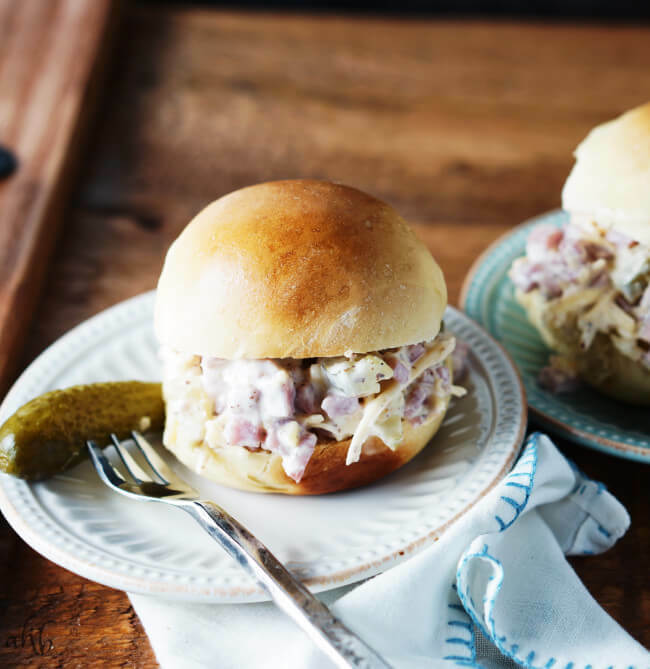 We like to put this ham salad on homemade Hawaiian rolls, but it would also work great as a wrap. If you’ve got some extra ham to use up and are looking for a quick and easy recipe, you should try this Cuban ham salad. It’s perfect for picnics, potlucks and just nights when you need food on the table in a flash. 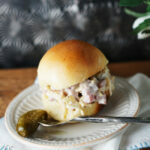 I recommend trying this ham salad on these homemade Hawaiian rolls. 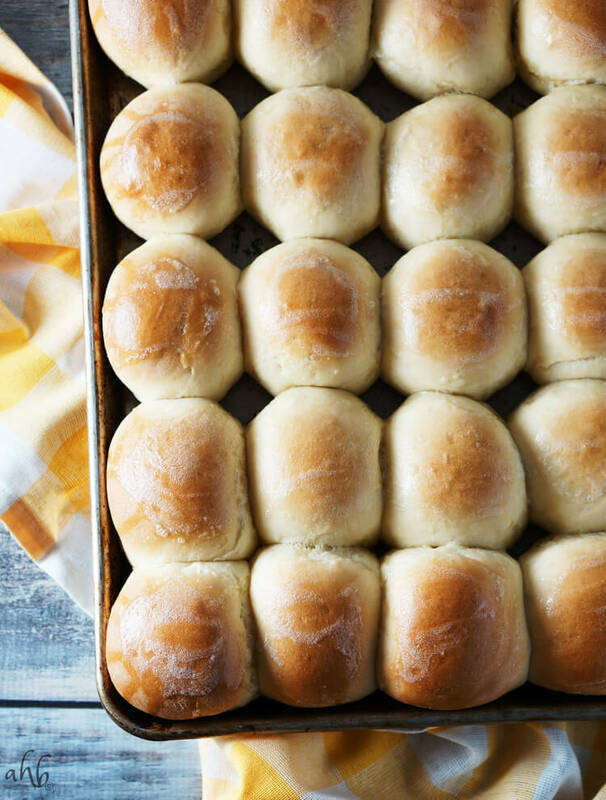 They are super soft and fluffy inside, but best of all this Hawaiian roll recipe is just 4 ingredients and super easy to make. 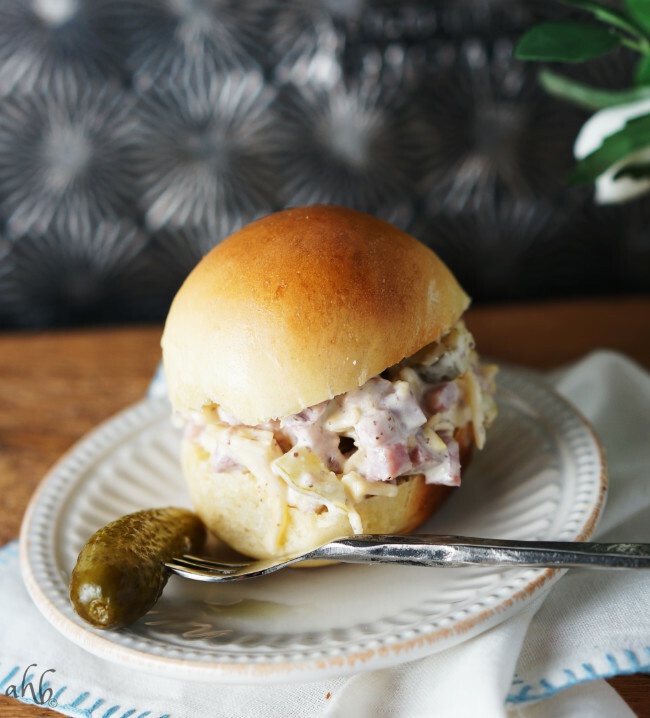 This quick and easy ham salad has the flavors of a Cuban sandwich. 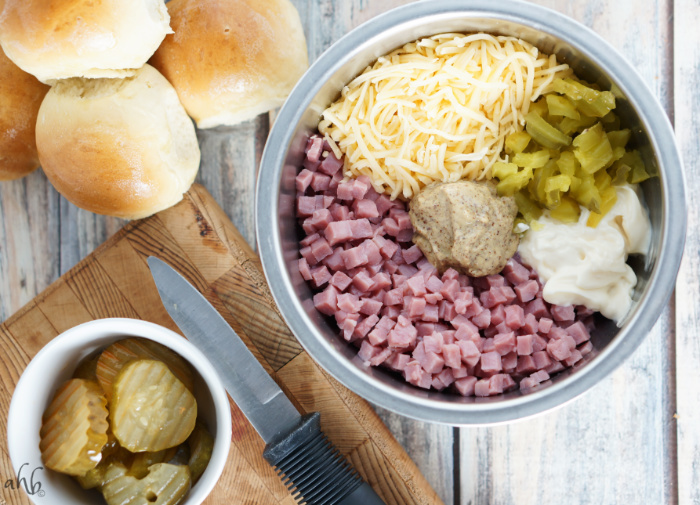 Mix it all together and spread it on your favorite slider buns or bread. Makes enough for 1 dozen sliders. This looks like such a fun alternative to chicken salad! Love the flavors! I can completely relate to the “agh, dinner” feeling! But this looks a great solution and love the flavors. Even people who love to cook sometimes dread rushing around right after work to make dinner. This is great for nights like that! Oh man, how good do these look!? I always have leftover ham that I’m not sure what to do with, so I’m totally giving this a try next time. Pinned! Sign me up to anything with pickles in it! The combination of the ham, mayo and deli mustard sounds amazing.